Weathernews and the Ulsan Port Authority Sign Agreement for Port Management Support Service and Sensory Infrastructure – Weathernews Inc.
Weathernews Inc. (Chiba, Japan; RMD: Chihito Kusabiraki) has announced an agreement on April 1st with the Ulsan Port Authority in South Korea（Ulsan, Korea; President：Chong Rok Park) to provide harbor information support that takes into account the geographical and meteorological characteristics of the region. The agreement is the first case of a private weather information company providing service to the Ulsan Port Authority. Weathernews service aims to ensure zero port accidents from weather following an accident in port last November where three vessels ran aground, and will include the installation of proprietary radar around the port for enhanced weather detection capabilities. Last November, three cargo vessels ran aground and spilled oil in the Port of Ulsan during a storm associated with an explosive low-pressure system. At the time of the incident, there was no dedicated weather information available for the port. This is believed to be one of the causes for the delay in making the decision for the vessels from leaving port and avoid running aground. Starting in January 2014, Weathernews and the Ulsan Port Authority began trial efforts to ensure zero accidents in port from the effects of weather, and have signed an official agreement formalizing these efforts as a risk management service at the start of the new fiscal year this month. The content of Weathernews new service will be port management support information on weather risks detected that exceed safety thresholds for vessels entering port. In addition to providing weather outlooks directly from forecasters at Weathernews, the company will provide detailed support to the Port of Ulsan for decision making that takes into account countermeasures like optimum timing for port closing and putting personnel on standby. 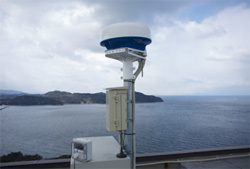 In order to effectively provide weather risk management service, Weathernews will install their proprietary weather sensing radar around the Port of Ulsan. Combined with an understanding of the characteristics of the region, the data provided by the network of compact radar installations will further enhance the accuracy of weather prediction to ensure that vessels enter and leave the port safely without incident. In the future, Weathernews plans to expand installations of their proprietary weather sensory infrastructure and service to other neighboring countries in Asia.